Most people are only vaguely aware of the electromagnetic radiation that surrounds us. Indeed, with exception of visible light, which consists of electromagnetic waves between about 0.4 to 0.7 microns in length (or millionths of a meter), all this energy is invisible to the eye. However, other portions of the electromagnetic spectrum, including (from long to short wavelengths) radio waves, microwaves, infra-red, ultra-violet, x-rays, and gamma rays each have distinctive properties and uses. The two figures below illustrate the different major types of electromagnetic radiation, as defined by the length of the waves from crest to crest. Figure 2. The Electromagnetic spectrum and uses of electromagnetic energy. As part of this technical background, it is useful to briefly look at the enormous scientific advances made by inventor, Nikola Tesla. Electric power is everywhere, present in unlimited quantities, and can drive the world’s machinery without the need of coal, oil, gas or any other fuel. Ere many generations pass, our machinery will be driven by a power obtainable at any point in the universe… throughout space there is energy…. As to power transmission through the space, it is a project, which I consider absolutely successful for a long time. Years ago, I could transmit power without wires to any distance without limitation, which was imposed by the physical dimensions of the Earth. In my system, the distance value is of no importance. The transmission efficiency can reach 96 or 97 percents, and there are practically no losses, except for the component, which is inevitable for the device operation. 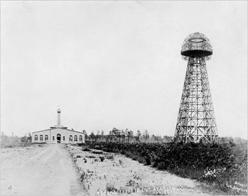 If there is no receiver, there is no power consumption anywhere…..
Tesla designed and began construction of the Wardenclyffe Tower on Long Island, in New York City in order to carry out this vision of a world system of wireless power and telegraphy transmission that would be able to send pictures, messages, weather warnings, and stock reports throughout the world. Tesla began construction at Wardencliffe in 1900 with $150,000 capital from financier John Pierpoint Morgan. The project was to include an 187’-high transmitter topped with a 68’-diameter, doughnut-shaped dome, consisting of a copper electrode. This was the prototypical “Tesla coil.” The source of the power was to be the Niagra Falls electrical power plant. The tower was to transmit this electrical power to the whole globe without wires and would use the ionosphere to bounce the energy back to all points on the surface of the earth. It would also broadcast communication channels of all radio wavelengths. The tower complex had a 100’ deep foundation and a square brick building, 100 feet on a side, that was built below it for a power-house and laboratory. The intent was that high frequency electricity would provide unlimited wireless electricity anywhere in the world, turning the earth itself into a gigantic dynamo. It would run all of the earth’s industry and transportation. Tesla also envisioned that this wireless power could be used for inter-planetary communication. At first, this project was funded by Wall Street financier, J.P. Morgan and Colonel John Jacob Astor. 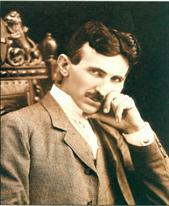 However, Morgan soon objected to the free nature of the energy, famously stating: “If anyone can draw on the power, where do we put the meter?” So Morgan stopped funding the project in 1906 just when it seemed that Tesla’s new system was destined to replace the AC system and make free electricity available to all. Of course, if wireless power generation worked, then the value of Morgan’s power utilities and copper mines would plummet. This could have wiped out General Electric, which Morgan had founded. Tesla also expected his “bladeless turbine” to replace the gasoline engine in automobiles, ocean liners, and airplanes. Sadly, on the night of March 13,1895, the day the power was turned on from the first (Tesla-invented) AC power generating station in Niagra Falls, Tesla’s lab burned down and all files and apparati were destroyed. Later that year, German physicist Wilhelm Conrad Roenten made public the first X-rays. If Tesla had had access to Roenten’s papers, he could have proved that he (Tesla) was the first to take pictures by X-ray. Also, the Italian Guglielmo Marconi had been hanging around Tesla’s lab before the fire in 1895. In 1901, Marconi was credited with inventing the radio. 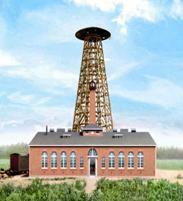 Tesla later stated, “Marconi is a good fellow. Let him continue. He is using seventeen of my patents.” (Eight months after Tesla’s death, the U.S. Supreme Court ruled that Tesla’s radio patents preceded Marconi’s and hence, Tesla invented radio as well). Desperate to acquire funding to keep his wireless energy transmission project going, Tesla sold his “bladeless turbine” and “death ray” patents to the Germans between WWI and WWII. He subsequently moved from New York City to Colorado Springs, where he conducted his famous “God of Lightning” experiments. His massive 52-foot diameter Tesla coils discharged more than 12 million volts at each burst, generating wireless waves that mediated electric energy for many miles. Unfortunately, there is little information on Tesla’s work in the field of wireless power transmission methods available today. Electrical energy can be economically transmitted without wires to any terrestrial distance… Wireless transmission of electricity has tremendous merits like high transmission integrity and Low Loss (90-97% efficient) and can be transmitted to anywhere in the globe and eliminate the need for an inefficient, costly, and capital intensive grid of cables, towers, and substations. The system would reduce the cost of electrical energy used by the consumer and get rid of the landscape of wires, cables and transmission towers. The bottom line is that others have verified and capitalized upon Nicola Tesla scientific breakthroughs. Military forces, in particular, have perfected many of Tesla’s technologies. This will become more apparent during this portion of the paper. Cheney, M., 2001, Tesla: Man Out of Time, Touchstone, 400 pp. Eisen, J., 2001, Suppressed Inventions and Other Discoveries, Perigee Trade, 560 pp. Mandal, T.K., 2006, Wireless Transmission of Electricity \u2013 Development and Possibility, Sixth International Symposium on Nikola Tesla, Belgrade, Serbia. Engineering, Sixth International Symposium on Nikola Tesla, Belgrade, Serbia.